The Board of Trustees of Southeastern NY Library Resources Council has opened the nomination period for the 2019 award. This award is designed to recognize an outstanding member library, cultural heritage organization, program, service, or staff member. This award is for Governing and HRVH members of Southeastern, including individuals at any staffing level, organizations, or programs created by member organizations. 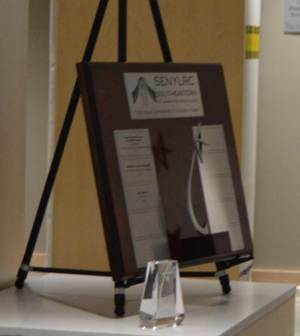 The recipient(s) will receive a commemorative award at Southeastern’s Annual Meeting with the winner’s name inscribed on the permanent award which is displayed at Southeastern headquarters. The recipient(s) will be invited to attend the Annual Meeting at no charge and, at their option, make a brief presentation. Award recipients are given one complimentary ticket to the annual meeting brunch. Leadership in the creation of a new or enhanced service model that can be emulated by other libraries or cultural organizations. Improvements in physical facilities that result in better services. Creation of an innovative program or collection that enhances the lives of the organization’s constituents. The development of a program that touches the lives of individuals who are otherwise underserved by their communities. Provision of a service to the community that is not available from any other library, archive, cultural heritage organization or library system, or that is outside the organization’s primary mission or the individual’s job description and benefited the community in which the organization resides. A candidate, organization, or program may be nominated by a co-worker, an individual from the library profession who resides in the region, by a member of the community served by the organization. Nominations are accepted from non-members as long as the nominee is either a Governing or HRVH member of Southeastern. Nominations will be reviewed by the Southeastern Award Recognition Committee, consisting of the Southeastern Executive Director, two members from the Board of Trustees representing different library types, and one Southeastern staff member. The award will be presented at the Council’s Annual Meeting in June. Nominations will be accepted until May 3, 2019. The Southeastern Award Recognition Committee will make the announcement of the award in mid-May.